This artist/architect team-designed station emphasizes and celebrates the appeal of both classical architecture and nature. 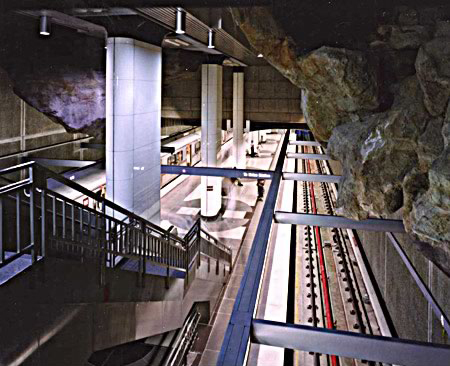 Glass-clad columns with shaped metal capitals provide stark contrast to the beauty of natural-looking rock formations found at all levels of the station, including the entrance area. Through their design, the artist and architect invite passengers to question their relationship to the environment and technology. Artist George Stone designed the rock formations based on the actual geology of this location. 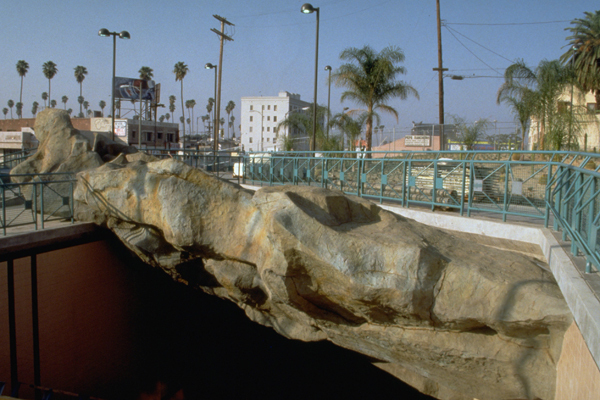 During the collaborative process, both artist and architect enthusiastically embraced the concept of inserting seemingly natural rocks within the contours of the traditionally designed station “box.” The unusual sculptures provide multiple levels of meaning. For example, their authenticity reminds riders that the station exists within a natural geological setting while their artificiality recalls illusory theatrical props used in the movie industry as well as the area’s numerous theme parks. Collaboration with Anil Verma Associates Inc., Architects. ANIL VERMA ASSOCIATES, established in 1985, has extensive experience in the management, planning, design, and construction of large scale projects in the United States, Canada, Puerto Rico, and the Far and Middle East. AVA’s projects include rail transit systems, ports, airports, highways, new town and civic centers. Verma teaches urban design and landscape architecture at the University of Southern California. Somesh Debnath was the senior architect on this project. GEORGE STONE is a Los Angeles native. He received his Bachelor of Arts from Cal State Long Beach and a Master of Fine Arts from the Rhode Island School of Design. 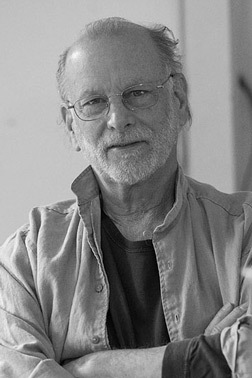 Stone is the recipient of numerous awards, and has had his work exhibited and reviewed throughout the region, nationally, and in France and Japan. Stone incorporates advanced technologies, sound, movement, and a sense of irony into his work.